Wing span: 1 7/8 - 2 5/16 inches (4.8 - 6 cm). Identification: Upperside is gray-brown. Both wings have a broken yellow-orange submarginal band surrounding 2-4 black spots. Underside of hindwing is mottled brown and gray with an obscure median band. Life history: Males perch on logs and vegetation, and occasionally patrol, to find females. Eggs are scattered near the host plants. In some areas, 2 years are required to complete development; young caterpillars hibernate the first winter, older caterpillars the second. Flight: One brood from mid-July to early August. Caterpillar hosts: Sedges, including cottongrass. 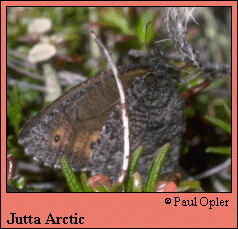 Habitat: Wet tundra, spruce bogs, lodgepole pine forest. Range: Holarctic. In North American subarctic habitats from Alaska east across Canada and the northern Great Lakes to Maine. Isolated populations south in the Rocky Mountains to Colorado.